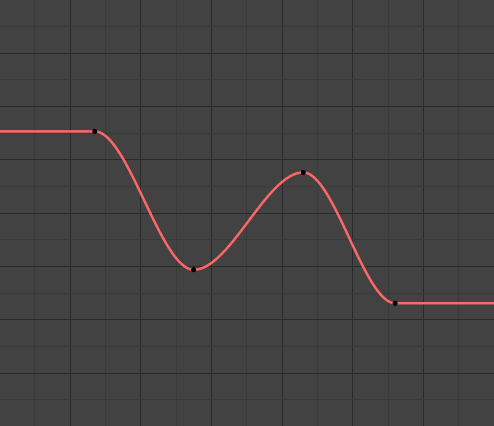 After animating some property in Blender using keyframes you can edit their corresponding curves. When something is “animated”, it changes over time. This curve is shown as something called an F-Curve. 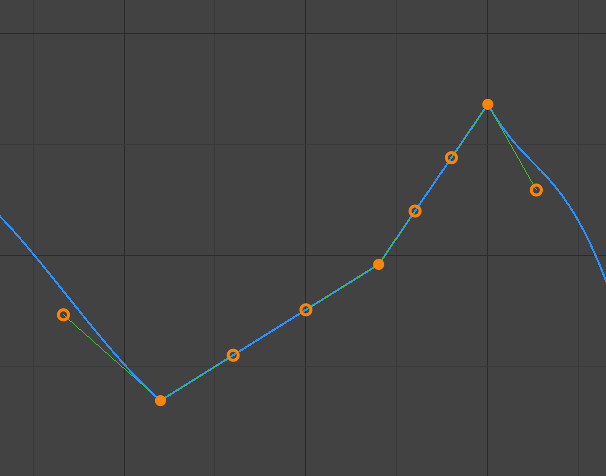 Basically what an F-Curve does is an interpolation between two animated properties. In Blender, animating an object means changing one of its properties, such as the object’s location, or its scale. It would be very difficult to get smooth variations of the property (unless you compute mathematical functions and type a precise value for each frame, which would be crazy). 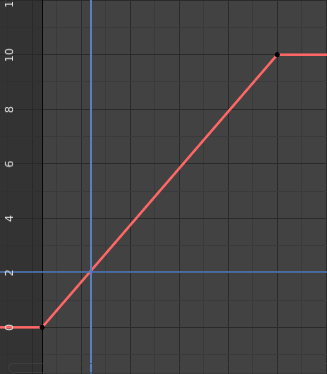 This is why nearly all direct animation is done using interpolation. The idea is simple: you define a few Keyframes, which are multiple frames apart. Between these keyframes, the properties’ values are computed (interpolated) by Blender and filled in. Thus, the animators’ workload is significantly reduced. and you use linear interpolation, then, at frame 5 we get a value of 2. 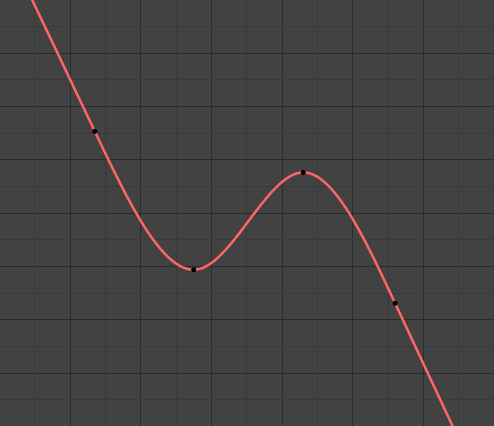 Although F-Curves are very similar to Bézier Curves, there are some important differences. When you move a control point ahead of a control point that was previously ahead of the point that you are moving, the two control points switch their order in the edited curve, to avoid that the curve goes back in time. For the above reason, it is impossible to have a closed F-Curve. F-Curves have three additional properties, which control the interpolation between points, extension behavior, and the type of handles. Mode for the Interpolation between the current and next keyframe. There is no interpolation at all. The curve holds the value of its last keyframe, giving a discrete (stairway) “curve”. Usually only used during the initial “blocking” stage in pose-to-pose animation workflows. This simple interpolation creates a straight segment, giving a non-continuous line. It can be useful when using only two keyframes and the Extrapolation extend mode, to easily get an infinite straight line (i.e. a linear curve). The more powerful and useful interpolation, and the default one. It gives nicely smoothed curves, i.e. smooth animations! Remember that some F-Curves can only take discrete values, in which case they are always shown as if constant interpolated, whatever option you chose. Different methods of easing interpolations for F-Curve segment. The “Robert Penner easing equations” (basically, equations which define some preset ways that one keyframe transitions to another) which reduce the amount of manual work (inserting and tweaking keyframes) to achieve certain common effects. For example, snappy movements. 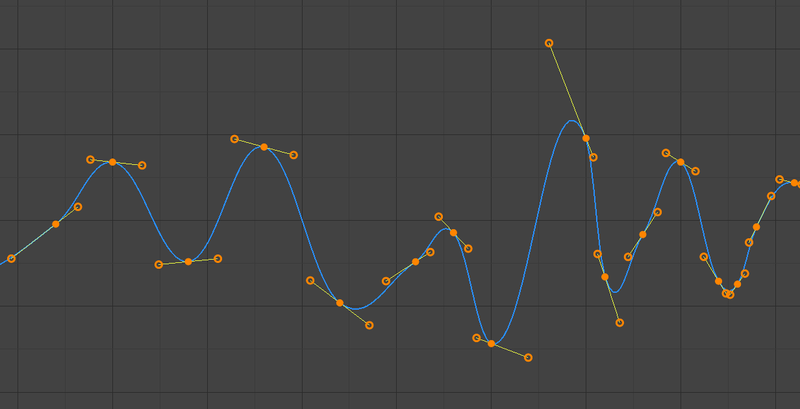 These additional easing types imitate (fake) physics-based effects like bouncing/springing effects. The corresponding settings can be found in the Properties region ‣ Active Keyframe panel. Exponentially decaying sine wave, like an elastic band. This is like bending a stiff pole stuck to some surface, and watching it rebound and settle back to its original state. The amplitude property controls how strongly the oscillation diverges from the basic curve. At 0.0, there is no oscillation (i.e. it just snaps to the B-value like an extreme exponential transition), and at 1.0 a profile similar to the one shown in the icon occurs. The period property controls the frequency with which oscillations occur. Higher values result in denser oscillations. Exponentially decaying parabolic bounce, like when objects collide. e.g. for Bouncing balls, etc. Cubic easing with overshoot and settle. Use this one when you want a bit of an overshoot coming into the next keyframe, or perhaps for some wind-up anticipation. The back property controls the size and direction (i.e. above/below the curve) of the overshoot. The Easing Type controls which end of the segment between the two keyframes that the easing effects apply to. The most commonly expected of the below behaviors is used. For the transitional effects, this is basically ease in, while for the physics effects it is ease out. Effect builds up to the second keyframe. Effect fades out from the first keyframe. Effect occurs on both ends of the segment. Extrapolation defines the behavior of a curve before the first and after the last keyframes. The default one, curves before their first keyframe and after their last one have a constant value (the one of these first and last keyframes). Curves ends are straight lines (linear), as defined by their first two keyframes (respectively their last two keyframes). Additional extrapolation tools (e.g. the “Cycles” F-Modifier) are located in the F-Curve Modifiers. 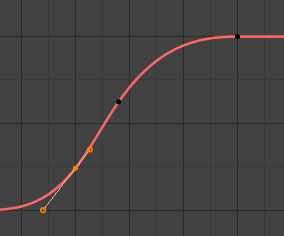 There is another curve option quite useful for Bézier-interpolated curves. 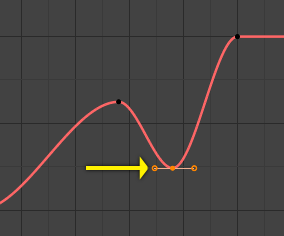 You can set the type of handle to use for the curve points V.
Creates linear interpolation between keyframes. The linear segments remain if keyframe centers are moved. If handles are moved, the handle becomes Free. Handle maintain rotation when moved, and curve tangent is maintained. Auto handles clamped to not overshoot.